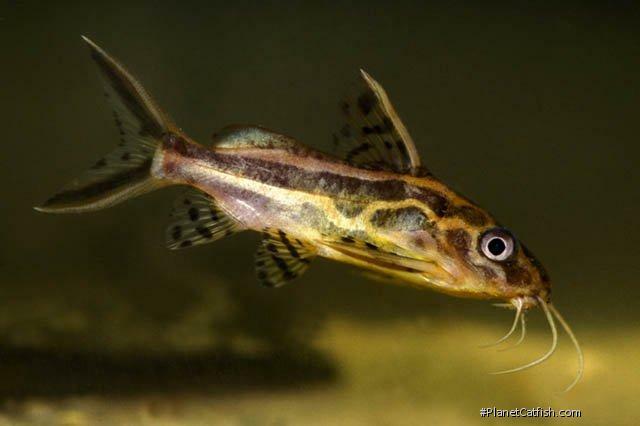 So-called because it is a very stripey fish and, at some point, put someone in mind of the pattern found on a pair of equally stripey Pyjamas; the Pyjama catfish has more than a quirky common name. It does truly have a lovely colouration (although I have yet to encounter such on any night garment) even its belly is a golden harvest yellow and this is a real favourite catfish of mine, one I have been wanting to write about for some time now. Those of you who have read the catfish of the month article for Synodontis angelica may remember mention of a photograph in an aquarium book which, virtually single-handedly, started me down the road of unusual catfish collecting. At the time I wrote the S. angelica piece, I only had the memory of the photo in my mind (having given the original book to a soon to disappear friend many years before). Happily, since then, a random visit to a small fish shop in Glasgow yielded another copy of the treasured book. Hopelessly out-of-date and more than a bit dusty, it was still a personal prize find and I smiled the whole drive home. It's always a good idea to have a good rummage through the book section of any uncommonly visited store - you never know what you might find. At the time I first saw S. flavitaeniatus in that book, another fishkeeping friend and I were in awe of it and the S. angelica pictured alongside. I have yet to see a more beautiful picture of S. flavitaenitus. Soon thereafter however I was crestfallen to discover the exorbitant price they commanded - well beyond the financial capabilities of a mere schoolboy - and the fish became more awesome; indeed moving into the realms of legend. Prices charged for this fish have dropped twenty fold since the early eighties and I now have a small group of these fish in one of my most favourite tanks to observe. The attraction goes beyond the distinctive rusty brown and painted gold stripes to the heart of its charm - it's the character and husbandry of the fish that are striking and elegant too. Many Synodontis species are quarrelsome or grow quickly to large adult sizes. Not the Pyjama catfish which is a slow grower (despite greedy eating habits) and my fish have yet to show any aggression towards each other. Although they have a surplus of hiding spaces and sole occupancy of their tank, it is not the most roomy. Yet there is still no sign of trouble in paradise. The decorations in my tank are PVC pipes upon which pieces of roof slate are placed horizontally. In addition I also use old "gourmet" coffee jars which are made of blackened glass. 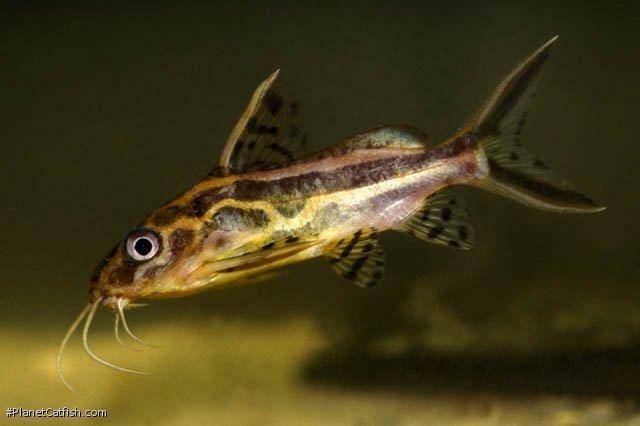 Some catfish reject these dark, cavernous retreats but all Synodontis love them and in the case of the Pyjama catfish, are occupied by the obvious ringleaders of the gang. Some plant cover is provided by a couple of pieces of java fern but the tank is dimly lit from the fishroom light rather than a dedicated tank-top fluorescent tube, so major plant growth is not possible. Feeding is flake twice daily or frozen bloodworm or brineshrimp once a day. Food is withheld periodically (around one day in ten) and the fish are visibly more active in their search for food or the claim of it when it is eventually available after this period. I find that feeding any fish that gorges itself benefits from a forced break in feeding now and again. The larger the fish, the longer the fast. This technique is not a great idea for continual grazers such as Corydoras and most Loricariids, but it works well with Synodontis and most other catfish. Although just a hunch, I feel it also benefits the filters. There are many strikingly species of Synodontis, the reason this one comes so highly recommended is its easy going, playful nature and relatively small adult size. Pay good attention to water quality and these fish will reward you for many, many years. A distinctive species that is not easily confused with the many other species of Synodontis. Lighter brown background typically with three darker brown horizontal stripes. Overall brown colour scheme can be strongly tinged with orange, pink (stress coloration) or yellow (older specimens). Some specimens may display a breaking up of the stripes into a mottled pattern. Fins are clear with dark brown mottling. Strongly forked caudal fin. Although reported to grow up to 15.5 cm in the wild, S. flavitaeniata is rarely if ever seen at more than 8 cm in the aquarium. The fish has a golden belly. Sexing Although differences in the genital papillae can just be noted in larger Synodontis, the smaller size of this species renders this technique impracticable. Generally females are larger, plumper and, with old age, more pale. Distribution Malebo Pool in the Congo River (a lake like expansion of the Congo River with an area of about 830 sq km, located 560 km from the Congo's mouth). Possibly also the Chiloango River in the Cabinda enclave of Angola. 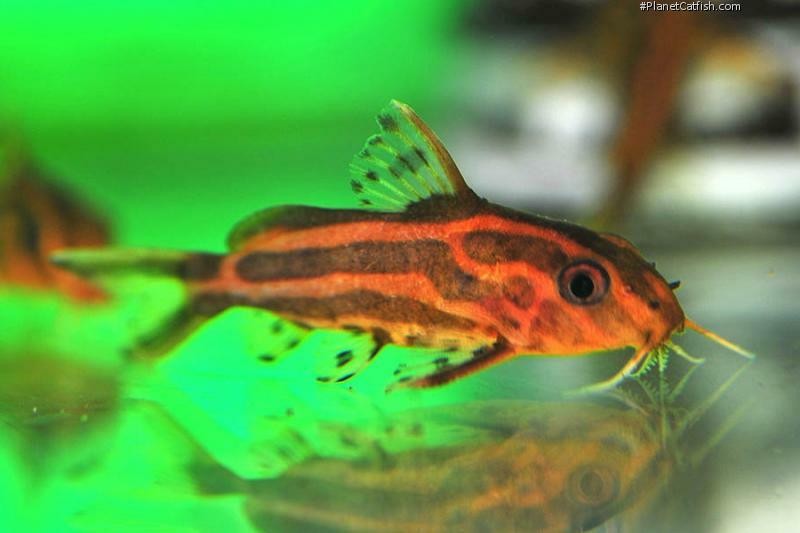 Other Parameters Has more stringent demands on water quality than most Synodontis. Although a riverine Synodontis, S. flavitaeniata seems to do equally well in slightly alkaline water. Fins and fin rays will erode quickly in water that is too acidic or of a general poor quality. Feeding Omnivore. Will eat flakes, sinking pellets and small live food. Does not compete well for food with more aggressive species. Furniture Use pipes, rock caves or bogwood hideouts - one per Synodontis is required. Although this fish is more sociable than most members of the genus, it will feel more at ease with plenty of places to hide. Plants are unmolested by this species. The fish does not invert as readily as some Synodontis, so bear this in mind when arranging the decor. Compatibility A peaceful fish which will not eat other fish, even small ones. Can be shy and reclusive if kept alone or with larger fish, but if kept in groups (4 or more), the troupe will reward the keeper with some comic antics during feeding time. Suggested Tankmates Good sized African characins and cyprinids are best; possibly even Asian Rasboras such as scissortails and the like if you wish to look further afield. A group of Pyjama catfish and a large shoal of Congo Tetras would be a sight to behold. Not a Syno for rift lake tanks or for housing with larger fish. There are 55 registered keepers, view all "my cats" data.